How much electricity does a fish tank use? If you’ve been watching Finding Dory and thought that owning fish might be a worthwhile hobby, then you’d probably be right. From researching what type of fish to get, to buying and constructing the fish tanks and assorted enclosures, to taking care of and maintaining your fish, getting into all things ‘fish’ can be a consuming hobby that can be both rewarding and frustrating. What’s more is that a fish tank – especially one holding tropical fish – can be a beautiful centrepiece to your home that is both a talking point and a crowning achievement. However, there’s a lot more lurking in that water than Goldy your favourite goldfish. Often, maintaining a fish tank is more than just a drain on your patience – it can be a drain on your wallet thanks to running costs, too. Keep reading below to see just how much you can expect to pay in energy usage to maintain your fishy hobby. So, how much does it cost to run a fish tank? How much does it cost to run an aquarium or fish tank? *Electricity costs based on single rate tariff priced at 28c/kWh. Running costs will vary depending on your tariff type and electricity price. 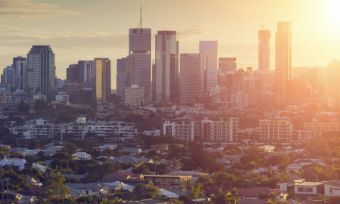 In general, consider the above figures to be an extreme example, assuming lighting is left on for much of the day, as well as the heater maintaining tropical temperatures of 28°C or so. Of course, these figures are just guides – you won’t know exactly how much energy your fish tank components consume unless they have energy ratings attached, or you monitor the energy use over a set period yourself, taking into account the ebbs and flows of heating and lighting. Read on for a further look into the fish tank components that can drive up your electricity bill. Similar to regular light bulbs around your home, different types of light bulbs illuminating your fish tank can of course affect how much power you use, and could consequently affect your power bill. In a lot of cases, lighting your fish tank is the biggest factor affecting energy usage – sometimes half of your fish tank running costs could be attributed to lighting! Fish tanks commonly use fluorescent bulbs, which commonly use anywhere from 15-40 watts. However, fish tanks commonly demand higher-wattage bulbs. Planted tanks usually require compacts that use up to 100 watts, while your beautiful – but higher maintenance – reef tanks may use metal halides, which can use up to 1000 watts! Assuming the worst, reef tanks generally need 4-8 watts per gallon (3.79L) of water, which equates to approximately two metal halides of 1000w capacity. Duration of illumination for your fish tank varies depending on your personal taste and needs. Generally, 12 hours is a ‘normal’ duration, which equates to – for our example above – 24kWh a day. Using our metric of 28c/kWh, that equates to $6.72 a day! Of course, extreme examples have again been used, but it goes to show how – just like most other appliances in the home – lighting your fish tank can easily be no mean feat. 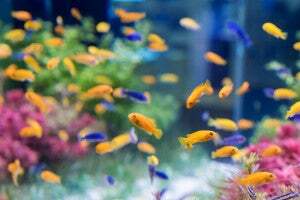 Coming in as the second biggest energy user in your fish tank, heaters might surprisingly use less energy than lighting, but still have the propensity to drive up energy use overall. Freshwater fish can generally get away with temperatures around 22°C, but tropical fish need temperatures of around 28°C, and of course the bigger your tank the more energy that is required to maintain these temperatures. Fish tanks in warmer environments generally require less energy to heat than ones in colder environments – that’s why in winter your power bill might increase. If you need to heat your fish tank to say 10°C above room temperature overnight, a 4’ tank might require two heaters, with a 100 watt capacity each. As expected, usage varies depending on the fish, fish tank size, your environment, and your own preferences. You may find heating your fish tank costs less, or significantly more. To a lesser degree than heating and lighting, pumps and UV filters also have a chance to contribute to your electricity bill. If you’re coming out of summer or winter shocked at how much your power bill has risen, then it’s worthwhile to take a look at the energy consumption of these appliances, but if you have a large fish tank then that might also have to be taken into consideration. Fridges have to be left on for 24 hours a day, which lends them to high energy usage, right? Yes, but they often use less than the biggest fish tanks – a massive 600L fridge uses around 1356kWh a year, and that’s a massive fridge designed for big families – or big eaters. Air conditioners get a bad rap for their energy usage, and while it is true if left on all the time, the truth is air conditioners don’t use all that much if used intelligently. Of course, air conditioner costs vary depending on the size of your air conditioner, the size of the room it is cooling and your own personal usage habits. At $80, that’s less than the quarterly cost of a 6’ tank! Clothes dryers also get a pretty bad rap as far as energy inefficiency is concerned. While it’s pretty well documented that dryers can use a lot of electricity, it might not be such an evil appliance after all. Given Australia’s long sunshine hours, many of us do without a dryer for most of the year. However, let’s say you use your dryer three times a week (in the winter months – June, July and August). This equates to $4.20 a week, which will roughly cost about $55 for the quarter. This is less than the quarterly cost of a 4’ tank in the table above! All in all you could potentially run a fridge, an air conditioner 8 hours a day for three months and a dryer three times a week for three months for a total cost of roughly $515. This isn’t scrimping either. In these examples you have a big fridge, fairly heavy air conditioner use and regular dryer use. This equates to a little bit more than the 6’ fish tank example, and much less than an 8’ tank as shown above. While these figures are indicative only, it does raise the question about whether your fish tank is the ‘silent killer’ in your house. It may be well worth assessing your heating, lighting and fixtures attached to the fish tank to see if you can opt for more energy efficient models and try to reign in the overall cost. But for now and the next time you are shocked by your power bill, don’t be surprised if it’s that fancy new fish tank contributing heavily to the overall cost.